The frigid winds coming off Lake Superior did not stop the Duluth area Snocross fans from coming out to Round 2 of the AMSOIL Snocross National Presented by Kwik Trip at Spirit Mountain. The previous nights action in the Pro rounds were packed full of bar-to-bar racing, where Tucker Hibbert found his way to his first win of the 2017-2018 season. Travis Kern in the Pro Lite division was able to pull the hole shot and lead flag to flag, but not with ease, as Marcus Ogemar and last years Pro Lite Champion Aki Pihlaja were ready to capitalize on any mistakes from the young Arctic Cat rider. With Duluth, MN holding the opening rounds of AMSOIL Championship Snocross Powered by Ram, you can always expect exciting racing coming from the riders as the anticipation and nerves are high for the first rounds of the season. Round 1 – The first heat of the day for Pro Lite featured the previous nights winner Travis Kern. Kern had an outside gate pick for Round 1 which caused him to have issues on the first corner. Travis was not able to continue the race and will look for better luck in the second heat. Cole Cottew ran down leader Dylan Jansen to take the heat win while Jansen settled with second and Andy Lieders crossing the finish line in third. In the second heat of Pro Lite, Marcus Ogemar nailed yet another great hole shot. Ogemar would lead the entire race although Martin Moland was charging hard and fell short to Ogemar by only a slight .1 seconds. The third heat showcased the Arctic Cats speed this weekend as Daniel Benham led the entire heat race flag to flag. Max Taillefer rode a strong race and was able to hold on to second while his Ski-Doo teammate and Pro Lite rookie Hunter Patenaude scored another top three finish. Reigning Pro Lite Champion Aki Pihlaja was also in the third heat but due to a below average start Pihlaja finished the race in fourth. The final heat race of Round 1 saw Andrew Lindholm pass Cameron Anderson and take his first Pro Lite heat win of the season. Travis Muller finished second while Kevin Wallenstein took the third position. Round 2 – After an action packed Round 1, the Factory Arctic Cat Duo of Travis Kern and Daniel Benham took the first and second positions of the first heat. They battled back and forth for the entire heat race with Kern winning and Benham a close second. Heat 2 was the most exciting heat race of the weekend. It say 3 riders Zak Mason, Travis Muller and Hunter Patenaude all battling for the top position. Mason had the lead early but would end up finishing third due to some mistakes on the uphill. Patenaude would pass the Arctic Cat rider of Travis Kern to earn him his first Pro Lite heat race win. In the third head of Round 2, Jake Yurk pulled a monster hole shot but was passed early by Marcus Ogemar. Ogemar would lead the rest of the heat to earn himself a great pick on the starting line for the main event. Jake Yurk would stay in second and Martin Moland finishes with another third in Round 2. The final qualifying race for Pro Lite spotlighted Andrew Lindholm take another Pro Lite heat race win. Reigning Champion Aki Pihlaja finished a close second with Jake Yurk rounding out the top three. Final – The AMSOIL Snocross National Presented by Kwik Trip is one of two events where the racers do not run in the dark. The 15 riders on the start line for Pro Lite made some changes to gear and machine preparing for one of the biggest races of the day. Daniel Benham took the holeshot and never looked back. The entire 14 lap race was rode perfect and precisely by the Factory Arctic Cat racer. Following in a close second was the Frattalone Racing Rider of Martin Moland. Moland stayed within 2 seconds of the leader the entire race but came up short as Benham was to strong during this main event. The battle for third started on the second lap of the race. Jake Yurk held on to the final podium position for 13 laps before Cole Cottew charged hard from 7th to take the position away. Aki Pihlaja and Hunter Patenaude were both running in the fourth position at different points in the race but both had problems at the base of the AMSOIL Finish Line. Jake Yurk finished his weekend off with a 4th place position while Hunter Patenaude rounded out the top 5. This class is exciting to watch with the 6 podium positions this weekend at Duluth being filled with 6 different riders. Stay tuned all season for a class full of bar-to-bar action. Round 1 – The first premier class qualifying highlighted to speed of Johan Lidman. Lidman would hold off second place Tucker Hibbert and score his first Pro heat race win in 3 years. Heat 2 saw Dylan Hall pull his 3rd hole shot of the weekend. Hall would race hard but the #1 of Kody Kamm would pass the Arctic Cat and take the heat race win. Kyle Pallin would finish in third, tying his best heat race finish of the weekend. The final Pro heat race of Round 1 was stacked full past Champions from all over the World. Pro rookie Leo Patenaude would lead the first lap of the race before suffering a mechanical issue forcing him to drop outside the top five. Logan Christian would take over the lead as Tim Tremblay and Petter Narsa worked through the field behind the #43 of Christian. The order for the final heat race finished as Christian, Narsa and Tremblay. Round 2 – In heat number one, Tucker Hibbert was able to pull his first hole shot of the weekend and was able to run away with the heat race win as Lincoln Lemieux trailed in second. Brett Nastala earned his first top three qualifying position of the season in the first heat. The second heat race of Round 2 featured the reigning Pro Champion Kody Kamm. Kamm would lead the entire qualifying race as Adam Renheim would settle into the second position, where he would end up finishing. Kyle Pallin on the #324 Polaris would finish with another third place in Round 2. The final Pro qualifying race of the AMSOIL Snocross National Presented by Kwik Trip had bar-to-bar battles for the entire 10 lap moto. Corin Todd and Logan Christian would go back and forth on the first lap before Corin gained an early advantage and started to put time between his Polaris and the trailing Arctic Cat. Corin would take the victory with Petter Narsa battling his way into second while Logan Christian would close out the top three. Final – The final race of the weekend featured 15 of the World’s Greatest Snocross Riders. 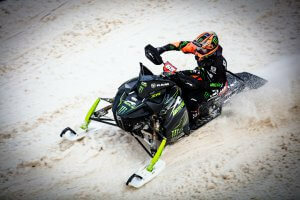 Tucker Hibbert picked up right where he left off by going across the finish line for the first lap in second position. Adam Renheim picked up the Studboy Holeshot Award and only let the #68 of Tucker Hibbert past him the entire race. This was Renheims first podium with his new team, Warnert Racing. The final spot on the podium was a battle for all 22 laps of the main event. The #13 AMSOIL Ski-Doo of Lincoln Lemieux was battling with past Champion Kody Kamm for the first half of the race before, putting a gap between him and the #1 Polaris. Kody Kamm’s teammate, Petter Narsa, held off on to another top 5 finish with fellow Polaris Rider Jake Angove right on his bumper. The rookie Angove had an off near the end of the race forcing him down to the 9th position. Angove battled hard and was able to put up his best Pro race finish with a 7th. Logan Christian also had his eyes set on the 5th position but lap traffic was an issue for the Arctic Cat rider. 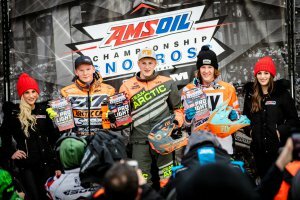 Kyle Pallin and Davis Joanis both had issues early in the race taking the Polaris riders out of contention for a podium finish. Tucker Hibbert sweeping Duluth in not an uncommon thing, Hibbert has been able to win both finals many times throughout his long career at Spirit Mountain. The Pro class is once again stacked this season so, look for the other past champions and young riders to make a charge at the #68 Arctic Cat. The Pro AM Women’s class was pure dominance by the young Ski-Doo driver by the name of Megan Brodeur. She was able to pull the holeshot and lead the entire race to take her first set of double checkered flags of the season. In second place, we saw Malene Anderson score a great start and choose solid lines to stay ahead of the third place and Reigning Champion Elina Ohman. Ohman was the winner on Friday night and she rounded out the podium today for a double podium weekend. organization in North America, sanctioning AMSOIL Championship Snocross powered by RAM events in addition to affiliating with nine regional circuits. Visit www.snocross.com for more information, fan and racer memberships, schedule details and listings for 17 exclusive one-hour shows on CBS Sports Network. A live stream link during events is free to fans at www.snocross.com/livestream.